Purchases are hosted via our official bandcamp page. 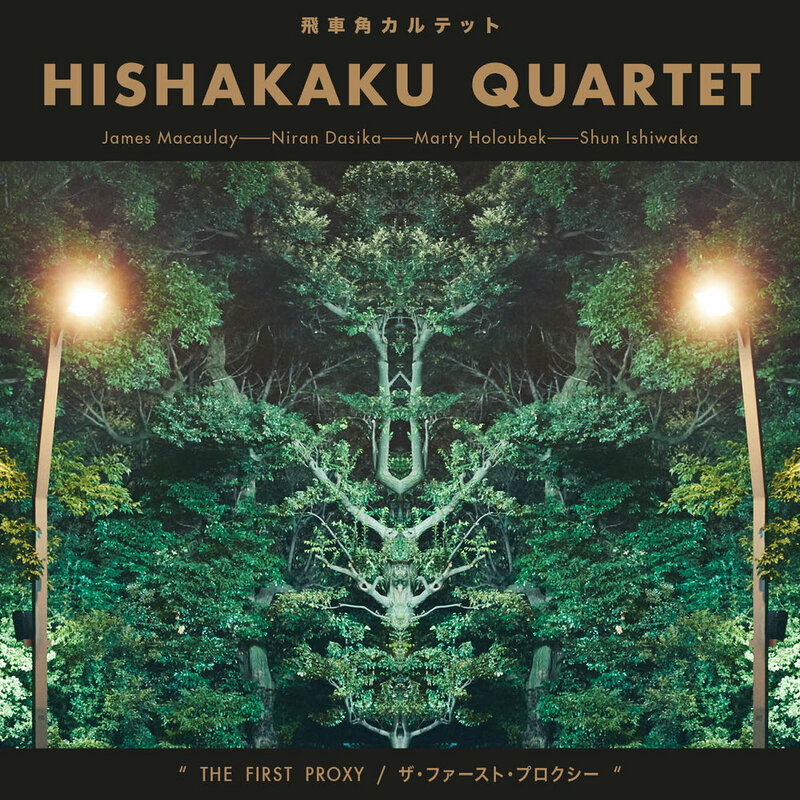 The Hishakaku Quartet’s new album The First Proxy is out now on Earshift Music with launch dates in Melbourne and the 2018 Wangaratta International Jazz Festival. Comprised of 2017 Australian Jazz Award winner and runner up, trombonist James Macaulay and trumpeter Niran Dasika, the chord-less quartet features inspired original compositions from the ensemble, synergetic interplay between the two front line and confluent support from Australian-Japanese rhythm section of Marty Holoubek and drummer Shun Ishiwaka. The band members have a long collaborative history of working together in groups such as the Lagerphones, Aaron Choulai Quintet, Niran Dasika Quartet, Shun Ishiwaka Clean Up Trio as well as other Tokyo-based projects. The new formation as the Hishakaku Quartet is named after their favourite Yakitori restaurant in Ekoda, which they visited following their recording session. Macaulay and Holoubek first met Ishiwaka whilst performing with Aaron Choulai in 2014 in Japan, and the musical rapport was instantaneous, particularly in the way Holoubek and Ishiwaka melded so well, able to play with freedom and creativity whilst retaining energy and momentum. This was documented on Choulai’s release Vada Taudia (Apollo Sounds, 2017). Dasika relocated from Melbourne to Tokyo from 2016-2017, quickly becoming an in-demand trumpeter, featured on several albums including Kemano’s Metamoru City (Sony Music Artists Inc), Akihiro Yoshimoto’s Oxymoron (MOR Records), Sumire Kuribayashi’s Pieces of Colour (Somethin’ Cool, also featuring Macaulay) and Ishiwaka’s second solo album Songbook II (YoungS’tones Records). Ishiwaka also features on Dasika’s latest quartet album Suzaku (Apollo Sounds). Elbow River is the name of a casino in Calgary, Canada, where I’d stopped on my way to Banff. When I wrote this shortly afterwards, the title seemed obvious. It explores the idea of rhythmic counterpoint between trumpet and trombone and reflects on the extraordinary landscapes found in Alberta. Tunes and reveries that never come to fruition. It is a meditative ballad where the melody is slowly fragmented between more improvisatory passages. This also features the small technical innovation of the ‘ramen bowl mute’ on the trombone! Written while procrastinating a particularly terrifying phone call. This song is a slow build, where the trumpet and trombone trade until the climax finally comes towards the end. Pathos and beauty found in the mundane, repetitive filing of paperwork and time spent on the Tokyo Metro Tazai Line. A ballad written for the Koto Ward Driver’s Licence Centre. This is a beautiful, hymn like composition with a fascinating structure. When lost within the realms of an insecure mind, reflect upon the people that surround themselves with you. As well as providing insight into Marty’s curious wisdom, this is an upbeat number with a big groove which alternates between 3/4 and 5/4. Himawari is the Japanese word for sunflower. This is a gentle, personal ballad, which took a long time to find an adequate title for. A love song without words. An ode to crushing isolation and its virtues. This is an introspective piece based an ostinato, where the trumpet solo eventually leads into a long, philosophical sort of melody. I used to teach chess at a primary school in Tecoma, which is a beautiful part of Melbourne on the way to Belgrave. I’d been playing some music by Tim Berne, and was fascinated by his use of active, often dissonant counterpoint. A self-explanatory title. Music can often lead one to procrastinate before even the most fundamental daily tasks. This is a simple waltz that captures quite a melancholic mood. Deep within the ever-expanding suburbia of western Tokyo lies a snack bar where dreams come true. But whose dreams are they really? This is a more funky composition of Marty’s, where he and Shun lock in fiercely and wonderfully together. The title refers to a small snack bar in Toshimaen where we sung karaoke all night with local friends. An album closer. This is a ballad that certainly evokes the enigmatic title. It also features Shun, who is an incredible multi-instrumentalist, on the melodica, which he’d just bought at a shop around the corner from the studio after we’d had lunch!